The weather here is still so warm its hard to think about the items needed for Autumn and Winter so I am still making up summer items to take advantage of the blue skies and balmy temperatures. I am constantly looking at my stash trying to get some order and an accurate listing of what I have, but as well I also love to keep sewing as much as I can to bring my vision into reality. 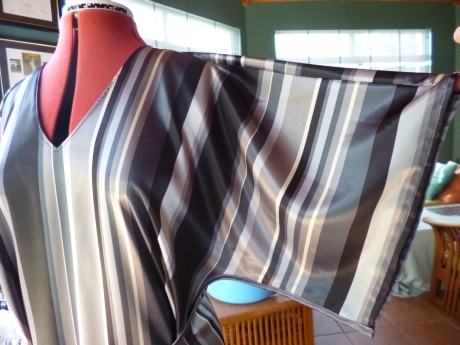 I had been looking at my stash and the patterns that I had and I decided to make up this lovely striped satin. I have had it for a while in my stash just waiting for the right design idea. 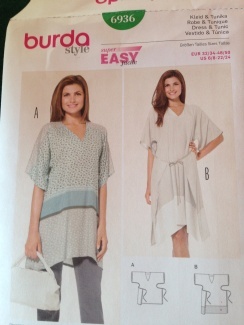 I decided to use Burda Style pattern 6936. I felt that this is a fairly forgiving style so I could get away without the muslin. The pattern is a very straightforward make, not terribly tricky . I really liked the use of bias tape to add interest on the wrap part of the dress. It is very easy to wear and looks good on. I made the longer version this time although I didn’t follow the pattern exactly so that I could have the effect I wanted I had to make some changes and I did my usual adjustments for my lack of height. The Front view when worn. I don’t have any pictures of myself in this yet but I just love it. 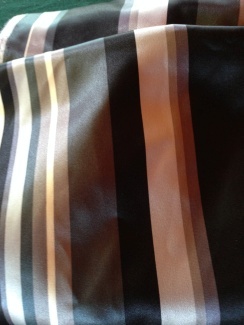 The fabric was one of those purchases that (I am sure I am not alone in this) I just had to buy. It is in the colors I love, it is soft and hangs really well. I discovered because of my changes to the pattern after I had finished it that the lower inside seam could be seen when it is tied. 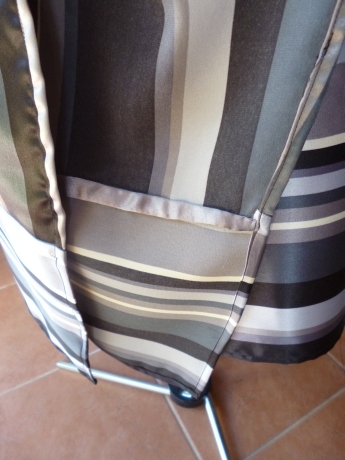 So I used grey bias tape and encased the seam on both sides for a more attractive result. 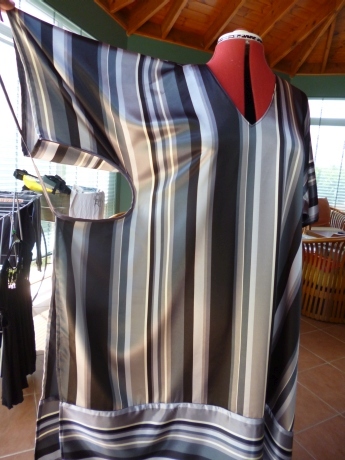 This was a great pattern to make , so much so my mother wants to come over and sew one with me for herself. It is really nice to wear as well, I have cut it out to make it in a few other different fabrics one sheer with a under slip dress. I will post that when it is done.